Buy it now or bid on the items. New or used, we process every single purchase with ease. Simply login, check out, and wait for the doorbell. Shop around the world, bid on anything or Buy It Now. Pay without revealing your financial information. Then go about your business, your purchase is on its way. 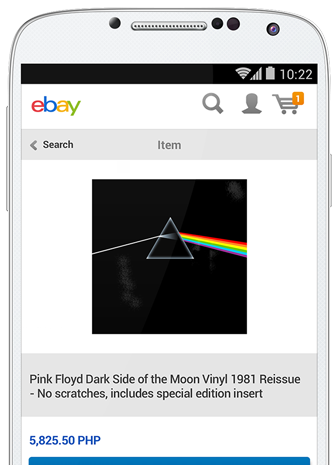 eBay is a place to store all your collections, share them and scope out others. Buy, sell, or just browse. Simply open an account on eBay and another on PayPal, and link them. Shop with peace of mind with our Buyer Protection policy. If an eligible item doesn’t show up or shows up significantly different than described, we’ll refund the full amount and help wrap things up with the seller. Keep your credit and debit cards in one place and pick one when you need it. Plus you get your card rewards. Simply log in with your email address and password. "With PayPal, I’m able to purchase exclusive clothing and bags online that my country doesn’t have." Search for the best deals on eBay. We accept 25 currencies from 202 countries and markets. Spin that globe. The world's largest online marketplace is now open to you. We bring buyers and sellers together, reducing steps and costs. The only middleman is the mailman. 1 1 pair of shoes is sold every 2 seconds on eBay. PayPal lets you pay the bill faster. Buying is usually free because the prettiest penny is no penny at all. A small currency conversion fee may apply when you buy from an overseas seller.